Damn. That was my initial reaction when I saw the latest drop from my fave French brand, Chloé. Who, by my standards, make the dreamiest clothes, bags and shoes, known to man. I’ve picked out the five items I would buy if I had a helluva lot of money to spare. Let’s start with this delicious mustard silk Ruffled Blouse. I love all the drama it has going on with the flouncy ruffles, high neck and sheer layers. It’s the ultimate chic, boho blouse I crave. 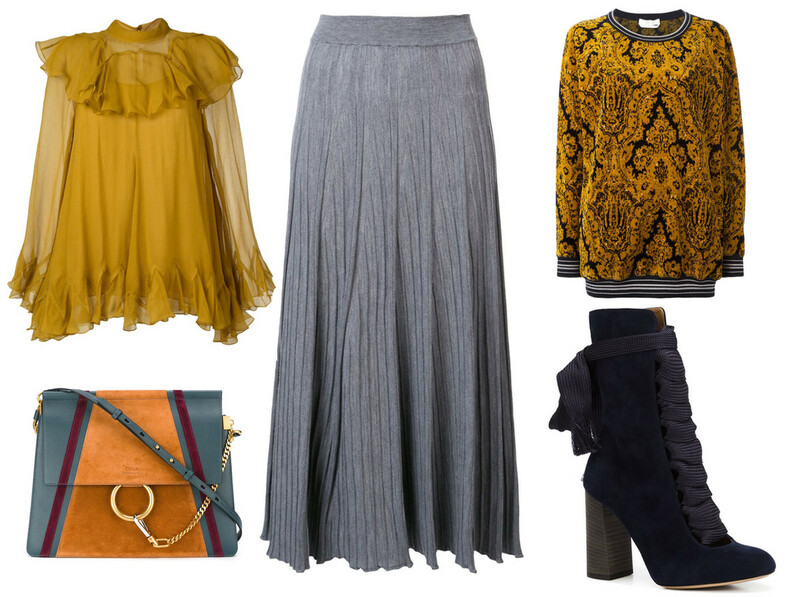 Pair it with this granny-chic grey Pleated Midi Skirt with its ribbed waistband and with the autumnal-toned Faye Shoulder Bag swinging from my shoulder, and I’m one happy lady. When it gets cold I’ll pull on my Jacquard Jumper with its sports vibe and flecks of gold. This would make Al happy as I’d finally stop borrowing his oversize sweaters. Wait one moment because we know that no outfit is complete without some killer shoes. I die for Chloé’s Lace-Up Boots in a deep navy. I adore the thick laces, the way they hit above the ankles and the almond toe. I would sell my soul for these boots. I would. Really. I’d be the happiest granny-chic bohemian around.